#6 Terriers face #10 North Dakota in the first round of the NCAA West Regional in Fargo, N.D. Puck drop is set for 3:00 p.m. with the contest airing on ESPN2 and being streamed on WatchESPN (link below). 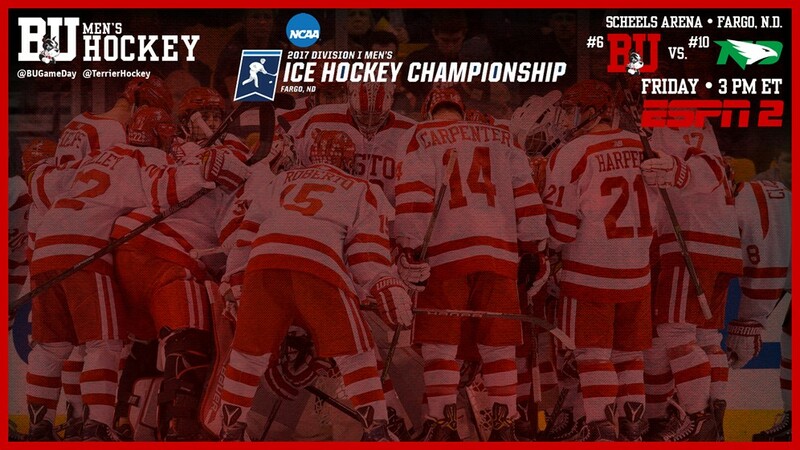 BU is making its 35th NCAA tournament appearance and 20th in the past 28 seasons (See BU game notes). The Terriers and Fighting Hawks last met in the 2015 NCAA semifinal with BU winning 5-3. (Video) . The teams split a weekend series in Grand Forks during the 2012-13 season and North Dakota has a 12-10-2 overall series lead. North Dakota, the defending NCAA champion, is led by sophomore Shane Gersich (21G, 16A), freshman Tyson Jost (15G, 19A) and sophomore Brock Boeser (16G, 17A). Goalie Cam Johnson has a 2.38 GAA and a .904 save percentage. Jost spent two seasons as Dante Fabbro’s teammate at BCHL Penticton and the two skated for Canada in the 2017 World Junior Championships (see article link below). BU's offense has five 30- point scorers: Clayton Keller (42 points), Patrick Harper (34), Jakob Forsbacka Karlsson (32), Bobo Carpenter (31) and Jordan Greenway (30). More information on both teams are in the game notes linked below. The winner of this afternoon's BU - North Dakota game will play the winner of tonight's Minnesota-Duluth - Ohio State game for the West Regional final. That game will take place on Saturday at 6:00 pm and the winner will move on to the Frozen Four in Chicago. Terrier fans in Boston are invited to attend a watch party at T's Pub, which is located at 973 Commonwealth Avenue. ► College Hockey News will have a live scoreboard for all NCAA tournament games. The teams split a weekend series in Grand Forks during the 2012-13 season and North Dakota has a 12-10-2 overall series lead. want to watch american and korean tv series and movies? Any Idea Where to watch movies online? In these days , you can Watch movie online for free without ads and payment needed. for more trending news try to visit "
Rally falls short; BU loses 3-2.